A flat roofing system is the best type of roof for a large commercial building. Having a sloped roof on such a building doesn’t work as well. it will be much more difficult and costly. Architectural engineering will need to be used to figure out how to handle the additional weight, along with any rooftop HVAC equipment and drainage solutions. One of a flat roofing system’s best benefits is they can also be as a deck, green roofing with rooftop vegetation, a big patio or even a penthouse apartment. Green building supporters like them, because of the rooftop rooftop vegetation option, which improves air quality while reducing the heat island effect in large urban areas. If you’re planning on installing a green roof, use 80 mil or thicker PVC or TPO membranes, because hot-welded seams will ensure the roof won’t leak underneath the soil and plants. Another major advantage is flat roofing systems work best where large heating & cooling equipment needs to be installed on the roof. With a flat roof, the equipment goes up on the rooftop, instead of being installed on the ground. Last, but not least, flat roofs are great for large-scale solar panel installations, because they won’t be shaded, which allows them to get maximum sun exposure over the course of the day. TPO and PVC are both very reflective, sending as much as 90% of the heat back into the atmosphere, meaning that these materials can help you save lots of money on your energy bills. Both are Energy Star Rated for their cool properties. One thing to make note of, however, is that the white colored roof coatings and materials will collect a lot of dirt and dust over their lifespan. As time goes by, this decreases their energy efficiency. They’ll still be highly reflective, however. Regular, routine maintenance scheduling will help prolong the maximum energy efficiency of your white membrane materials. Many darker colored membranes have recently been created to also have light-reflective abilities and offer energy savings. You should take note of the manufacturer’s specs on the particular brand you’re using to check their energy efficiency ratings. Modified Bitumen and EPDM have the lowest energy efficiency rating of these materials. Because they are darker in color, they warm up to as high as 170 degrees in the hot summer months, which will make your HVAC system work harder and raise your energy bills. PVC lasts the longest of these materials. It has heat-welded seams, which allow it to stay flexible during its lifetime and it will withstand thermal movement. A PVC roof can have a lifespan longer than 30 years. Manufactures usually offer a 25 year warranty for commercial installations and some offer lifetime warranties for residential applications. EPDM will only last about 10 to 15 years. Even though manufacturers offer warranties that can be as long as 40 years for commercial flat roofing, you need to be aware that these warranties don’t cover failing seams or ponding water. Keep in mind, both of these are the main causes of failure for a roof with rubber membranes. The average lifespan of a TPO roofing system fluctuates due to issues with their membrane’s formulation. Currently, they range from 7 to 20 years. Manufacturer warranties are up to 20 years for commercial TPO installations. Warranties offered on different kinds of single-ply membranes highly dependent on thickness, size, method of installation, and environmental conditions. You should read and carefully compare warranties that come with the different materials you are choosing from. Tar & Gravel, along with Modified Bitumen, can last 10 to 20 years, but they’re expensive to tear off and remove at the end of their service life. How long they last depends a lot on the company that does the installation, because there aren’t a lot of roofing contractors left that actually have experience working with this material. If you have this type of roof and it needs to be repaired, your best bet is to call on a professional roofing contractor that has experience with it. Someone who specializes in single membrane roofs wouldn’t be a very good choice. The biggest issue for most of these roofing systems is the presence of seams and flashing, because those are the main areas where leaks happen. PVC and TPO – the only two membranes that have hot-welded seams that don’t come apart, and don’t let any moisture penetrate. Tar and Gravel, Modified Bitumen and Rolled Asphalt – offer extremely inferior protection against leaking and ponding water. EPDM rubber – typically fails at or around roof penetrations, along with flashing and seams, which allows moisture to penetrate. Spray-on roofing systems – the insulation can be destroyed by birds, therefore also resulting in leaks. Built-up roofs are usually 0.5 + inches in thickness, and the materials they’re constructed of are pretty hard and difficult to puncture. Single plies and spray foam roofs are generally pretty easy to puncture by direct contact with a sharp object. Some PVC materials come with a fiberglass reinforcing cover, which makes it difficult to puncture. Remember that increasing the width of a single ply membrane DOES NOT improve its ability to protect against leaking, However, it will extend its overall lifespan, and make it much more puncture resistant. 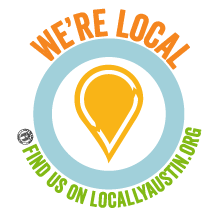 At Armadillo Roofing & Exteriors, (512) 333-7663, we provide commercial flat roof repair and commercial flat roof installation services to Austin, Texas and all its surrounding communities, including Oak Hill. 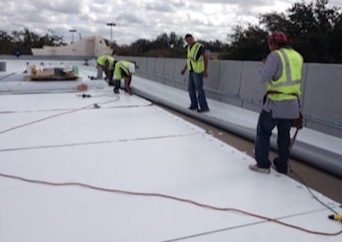 We have been providing commercial roofing services to the area for over 15 years. 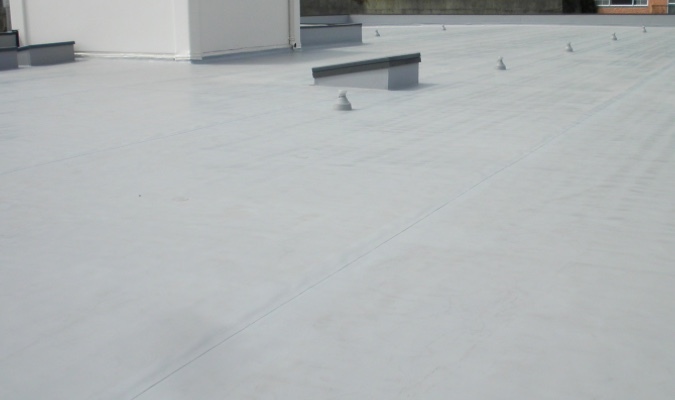 When you need experienced, professional repairs on your commercial flat roof, give us a call.